Amanda’s note: Here is another wonderful contribution from Ramya Venkateshwaran who writes from her home in India. Ramya describes a simple and effective remedy to clear your sinuses that has a long tradition in India. Find her on her website WildTurmeric.net for more ideas on healthy living. ~~~There are many varieties of trees that belong to the genus Vitex. The one that is very common in India is Vitex negundo. It is commonly known as five leaved chaste tree and it is also used to ward of mosquitoes. The best way to identify the plant is with it’s beautiful flowers. I was quite surprised when Amanda told me that vitex plant is increasingly common there in the states too as a landscape plant. It is always nice to have medicinal plants and herbs in common with other countries :). 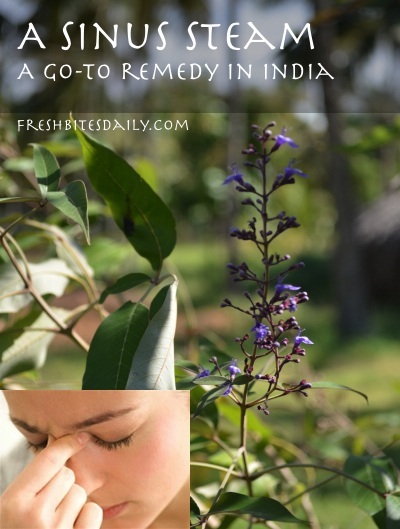 Here in India, we have been using vitex to treat sinus problems for centuries. I can confidently say that vitex is very effective for treating sinus as I have a personal experience with it. In fact, if you ask even a small child in my village a remedy for sinus headache, he or she will quickly recommend this steam — it is that famous. Vitex has anti-fungal, anti-bacterial, and analgesic properties making it quite effective in home remedies. We follow a certain method when we use vitex leaves for treating sinus infection that many of you will find very interesting. First we collect 3 large, smooth stones and here we use a special type of a stone called “vengachangal.” This variety of stone retains the heat very well for a long time. Use any variety of stone that retains the heat well. We heat the three stones until it is very hot in open fire. Next we boil water in a huge vessel and once it comes to a boil, we add the vitex leaves and switch off the heat. After placing the vessel in a safe place, the patient is made to bend over the vessel to inhale the fumes of vitex leaves. We also cover the patient with a thick cloth to prevent the steam from escaping. After a few minutes the temperature of the water will go down. We take one of the hot stones that has been heated up in the open fire and drop it in the water. When you are doing this treatment, you should be very careful as the water will literally start boiling again. Continue with the steaming and keep adding the rest of the two stones as the water temperature goes down. We do this treatment even for very young kids here. When I was younger, I used to suffer a lot with sinus problems. Even with the pain in the cheeks during the steam, I used to readily do this treatment without any fuss as it gave very immediate relief. When you are doing this treatment there are few things you should remember. Add enough vitex leaves and make sure to steam for enough length of time, usually we do it until the 3 stones have been used up. If you don’t want to add the stones, you can reheat it in the fire again and then do the steam. I only do the steaming in a electric steamer when I am really pressed for time. Otherwise I always prefer to do the treatment the traditional way for a longer duration but using slightly less temperature. Your face will be flushed and slightly red, but this is normal like you experience with any kind of steam. The sinus pain will be partly or fully gone depending how severe the condition is. Please don’t wash your face immediately in cold water, which many will be tempted to do. If you spray cold water on hot flushed face chances are that you will get back the headache in full force. Wait for at least 10 minutes before washing your face. Try to do the treatment again the next day. This treatment gives amazing results each time. This treatment also cures a stuffed up nose very effectively. Use the above said method for treating sinus infection. For treating blocked nose, you can also add a few drops eucalyptus oil to the mixture. We usually do the treatment for 3 days. By then we are usually cured of sinus completely. The leaves have a unique smell that is so very good, especially if you are suffering from a headache or blocked nose. After boiling the water, wait for a few minutes so the temperature is even lower for them. Make sure they don’t touch the hot pan and if you are using stones, be very very careful as the water will come to boiling temperature. Also don’t cover them fully with the sheet, they will not be able to tolerate the heat. Though this method has been used traditionally in India, James Duke in the Handbook of Medicinal Herbs cites potential adverse reactions in cardiac cases with the variety Vitext negundo due to the cardiac glycosides in the plant. The use of the berry of the variety Vitex agnus-castus is contraindicated in pregnancy and while using birth control.